The debate on bank nationalization in the United States is off to an inauspicious start. Most of the arguing so far is framed in terms of: yes/no, or what kind of in-between strategy can be tried and for how long. This misses the point. In some important and not good ways, we have already nationalized the financial system. This entry was posted in Commentary and tagged Banking, nationalization. Bookmark the permalink. I have a question that I have asked before, but have not gotten an answer, or seen one posted. I’m new to this topic, so I hope it is not too naive. Are there any large or regional banks that are solvent? If so, why not do everything possible to beef them up to get into the major leagues? In other words, can we focus on the parts that are working in hope that they can take up the slack from the parts that don’t? With the insolvent banks, it seems like we’re throwing good money after bad. According to the FDIC there are about 8348 banks that they insure. Some of them must be solvent and some of them must be worth a few billions, if not trillions. And to do all this, what it takes is tremendous confidence and political courage, which seems to be lacking at the moment. I’m trying to understand the sense of giving more money to a business to keep it alive than its worth, while leaving in place some of the least competent managers on planet Earth. Maybe it makes sense, but its a mind bender at the very least. Somebody help me. Please. He came in with a terribly deficient “data base” in this area that allowed him no independant basis for making strong and confident political judgements; then he hired the DSG rump of the Democratic party in the form of Larry Summers and Rahm Emmanuel to run provide those judgements and lead the policy formation process. He, and we, are the captive of the DSG/DCCC/DSCC “New Democrat” and Bill Clinton wing of the Democratic party, not the Democratic wing of the party – and they are once again destroying the party. Now Bill Clinton is out on the stump touting the lie that the publics, and most Democrats, revulsion at the policies that Emmanuel, Summers, and Geithner are selling is because President Obama has not been “upbeat” enough in presenting them. Its a disaster of the first order. Economic policy is in the hands of the economic policy team that contributed so much to the creation of the policy regime responsible for our current predicament, during the Clinton years – up to and including the failure to veto Gramm-Leach_Biley, and not crediting and supporting Brooksley Born when she attempted to get control of the derivitaves markets while at the Commodity Futures Trading Commission. It seeems the debate is comming full circle, maybe the market place can regulate itself (in a fraction of the time). Thanks to the internet and the speed of information sharing I hope that instead of taking 40 years to correct the mistakes of New Deal socialism we can get back to capitalism in under 10. As everyone is observing, until it is unwound in as close to an orderly bankruptcy that can be mustered, it aing going to end. The United States of America is a trillion dollars poorer as a result of the guarantees and the loans that may never get paid back. THE PUBLIC HAS BEEN HELD HOSTAGE to the idea that the world would end if money wasn’t given to the firms that were, “too big to fail”—and the tailors to the emperor (us, we the people) passed out maybe a trillion $USD to the guys who, if truth be told, several should have failed (probably those who received FREE money from AIG via the tailors telling us (the emeror) that the world would end if we didn’t save AIG ( to pay everyone who had their money with AIG and probably would have gone bankrupt if that FREE MONEY FROM WE THE PEOPLE hadn’t been given to “save the world” . Next, the tailors insist that world will end if Merrill isn’t purchased by a certain entity (Bank of America)—strangely, has anyone ever heard of a firm being told that “to save the world” they need to buy a company that is going bankrupt but, oh by the way, pay $29/share for the bankrupt company that you need to acquire or else the world will end as we know it? Yes, one of the beloved banks that provides credit facilities to large companies, is soon to “officially” go under the hand of the tailors. But, to save the world, the tailors need to buy shares of this bankrupt entity (just like AIG) to save the world, so that not just 350 BILLION will go up in smoke, every penny spent on this plan to buy shares will disappear from the face of the earth, no longer to be of any use to any emporer (us, we the people) , all in the name of saving the world. I guess it would just be too dangerous for the government that was created by we the people to insist that failed entities be temporarily taken into conservatorship while responsible parties stepped in to buy the pieces at a proper an lower price, certainly lower than $29/share—I guess that is just TOO DANGEROUS because after all, God forbid we have NATIONALIZATION—IT IS OK TO LOSE TO A BLACK HOLE (THAT WE CAN NAME) OVER A TRILLION DOLLARS, BUT IT IS NOT OK TO SAVE THAT MONEY BECAUSE THE WORLD WOULD END IF WE DIDN’T SEND THE TRILLION THROUGH THE BLACK HOLE TO THE FOLKS THAT GAVE US THIS DISASTER!!! There are two sides to the nationalization discussion. I think Professor Johnson may be underestimating the difficulty of the task. Both Bank of America and Citibank the large weak banks have over a trillion dollars each of assets, BAC employs 310000 people, Citigroup 352,000 people. The holdings of these two banks are baroque, Byzantine. What would be the cost and the time necessary to liquidate these banks. If this cannot be done quickly it cannot be helpful. Opensecrets.org documents the roughly 1/3 of all Campaign costs roughly 400million dollars contributed by the financial establishment, significantly by the large money center banks. While ending our version of the Guilded age would be a good thing indeed, it means that the power of the major parties to elect individuals typically incumbents would be weakened. No doubt they would be unhappy about losing incumbent seats to independents. As for political favoritism for credits etc. 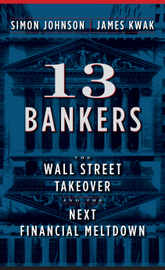 characterized by nationalized banking systems we have this already as Paulson’s moves amply demonstrate. It will not change. Whether or not it is better than the current Free Market system in practice remains to be seen. Certainly one cannot argue that the market has accomplished an efficient and wise allocation of capital in the last few years. The Size and Sheer Complexity of Citigroup is beyond the capacity of the US government at Present. Our Career Civil Service is weak compared to our European counterparts and the Fed is not a large employer and neither is the FDIC. Its unclear whether they are up to the job of liquidating Citigroup and Bank of America. Also this will not be a fast liquidation because of the size of the banks so new banks able to efficiently lend will not be forthcoming quickly given bank liquidation which is what is being discussed. Another question is who will purchase the large stock of non-toxic assets held by these banks. I don’t think Americans would be happy with the First National Bank of Shanghai, or the Saudi American bank run and operated by the Chinese. Its a good question whose pockets are deep enough, has the capability to run a large bank other than the not so competent people who are doing it already. In the short term the Fed has little choice but to become a Commercial Bank. Also liquidation of Bank of America and Citigroup would not increase lending in the immediate term. In the long term the banks which are under water should be liquidated but by that time the Fed and the Stimulus will revives the economy. In short, the proponents of liquidation of the insolvent large money center banks have yet to argue in a serious way that this solution is even practicable. The argument would be much stronger if a convincing case could be made that such a liquidation could be done rapidly. It is not just that they are incompetent, but they are drawing HUGE salaries, being parasites, evidently FOR BEING INCOMPETENT. IT IS NOT ALL BANKERS. I have to keep reminding myself of that. But that they can command a huge salary, just for being in the good old boys’ club, is just ridiculous. If it is not criminal, it buggers the imagination why not. It is like having an aristocracy, or a royal family – only we don’t even really know who they are. Even if we look them up, we don’t know them from Adam, so we don’t have a clue what their worth is. But we just got done having one of their type as President, and look at what he – and they – have gotten us all into. And they won’t even own up to their failures and incompetency. But that they are bleeding the system is what buggers me the most. Carnivorous, economic vampires – that is all they are. Is our system doomed to have their kind forever? I have to think not. And if something like this won’t get rid of them, how could it possibly ever happen? NOW is the time to boot them out. I have a question about nationalization and how it relates to credit default swaps. Does nationalization count as “failure”? In other words, are there a bunch of other institutions that will be on the hook via CDSs if Citigroup and/or BoA are nationalized? The consensus seems to be gathering around nationalization, but the government seems curiously untouched by that gathering consensus. They seem just as intent to pussyfoot around as they ever were, and I wonder if there’s a reason why. If there ARE a bunch of other institutions that would be on the hook, well… maybe zombie banks are better than corpse banks with a highly communicable form of default swap plague. Or, maybe the government needs to do these stress tests so we can nationalize all the intertwined bodies at once. One by one or one single seizure, the end result for the institutions would be the same, but surely a single seizure is a lot less panic inducing than a cascading series of failures. For one thing, they’d have the benefit of knowing exactly what they’re getting into. In an environment of economic contraction the financial viability of very large Chimera banks created after the Clinton Presidency failed to veto Gramm-Leach-Biley may be a side issue. At least that may be so compared to the need to recreate the money supply that vanished when the derivatives based assets those institutions had created (or their non-bank parts and partners had created) became uncertain in value. But in the current policy environment their chimeric existance as likely insolvent insititution imposes significant constraints on policy options available to deal with the problem of contraction of real economic activity. Doubts about their solvency and viability, and about whether they will ever be willing to lend again, creates confusion about the source of the problem with the real economy. Is it still a “credit” crisis with the banking and specifically mortgage banking and derivitave instruments sectors at its heart? Or must it be addressed as a much larger and more pervasive problem of a general failure of the money supply, and treated with measures appropriate to that very different problem? Clearing the suspect financial institutions problems out of the way is likely to be necessary, before we can see, and get agreement about the nature of the balance of the current economic contraction. That clearing therefore must be accomplished swiftly, and with clarity, and in a way that does not leave a lot of the fog of war on the field after it is accomplished. Once the banks which should be taken into receivership are identified (stress testing does that) then those banks can be swiftly taken, reorganized, and reprivatized. This requires a means by which it can be accomplished without incurring the political costs associated with “nationalization” except as an announced very short term action; without requiring liquidation of the assets of the institutions or interrupting the operations of their true “bank” banking activities; without charging costs of recapitalization of the banks to the taxpayer, and without relieving the owner/shareholders and bondholders of the bank of the risk they assumed when they took their investment in the institution. It does not require the establishment of a government owned or run “bad bank”. It does not require direct siezure or long term control of the equity of the shareholders. It does not leave the taxpayers with responsibility for sorting out any “bad bank” investment assets – those stay with the shareholders. A comment at Nouriel Roubini’s site by “By 2cents on 2009-02-23 10:12:13” indicates that there will be resistance to such treatment within both government and the banking industry, and that it will be necessary to account for (recoup) government funds already given to these banks. Can’t disagree on these points. But this approach is the most concrete, least subject to resistance and misconstruction, and gnerally likely to be most acceptable and produce the best results, according to my limited understanding of these things, that is available. Speaking as a simple private citizen I think the hurdles should not stand in the way but be overcome, and those who are in a position to cause movement by the banking and government players should carefully consider throwing there weight behind it. How will this lead to “politically connected credits”? The government, as you acknowledge, DOESN’T have any real control over the banks right now. Indeed, that seems to be one of your main criticisms of the current situation. The risk of politically connected credits would be much, much larger if the government actually nationalized the banks (or acquired common stock w/ voting rights). You can’t have the argument both ways. attn Karl: Citi and Co. can’t be allowed to go bankrupt because their creditors would be publicly ruined. It’s OK for them to be privately ruined, as they are now, but as soon as the dirty underware is hung out then the game is over, the cash registers start to refuse to accept types of payment, the natives get restless (and hungry) and the looting begins. So Obama is resisting nationalization because it will be hard to fix. Those interests that will lose money and power as a result, who will be proved wrong, have nothing to do with it. Who are the stock holders of the stock in the insolvent banks? Granted, they have already effectively been wiped out for the most part (there’s not too much farther to fall to zero from the 2% remaining in the stock price), but assuming they are zeroed out in a receivership, who is it who is taking that hit? It seems like they would lose little compared to what they have already lost, and they stand to gain (as taxpayers and citizens) from the same benefits we would all share from the effect of hitting a “reset” button on a broken banking system. What am I missing here? A question. How would “we exercise leadership”, i.e. organise a coherent leadership structure and process for this undertaking? Not being an expert on U.S. financial regulation and oversight, my impression is that the current patchwork of competing and overlapping agencies and authorities would be incapable of processing such a complex undertaking. It would be interesting to see a blueprint for the institutional framework that should be set up to deal with the situation, as described in your post, effectively. Wasn’t this the plan with AIG? That doesn’t seem to have worked. I think the critical issue is the willingness to recognize losses. So far, the government has failed to break up AIG because “the bids on its component businesses are too low.” That’s another way of saying they don’t want to recognize the losses. I am not sure that really gets us anywhere. The nationalization will briefly seem like a step in the right direction, until you realize that the politicians have no more courage than the management did. How many sharp people like you two and Yves Smith et alia (not to mention the general public, half of whom opposed the stimulus bill and a majority of whom oppose the bank bailouts) will the self-serving plutocracy ignore? I am working under the hypothesis that the American social contract is broken, and I challenge you guys to address what it will take to disestablish the plutocracy. Strauss and Howe predicted that we are heading toward “ekpyrosis,” the death and rebirth of America (see http://animalspiritspage.blogspot.com/2009/02/onward-to-ekpyrosis-death-and-rebirth.html)–but does it have to be that way? I challenge you guys to take on the political economy of the current situation. could be used to accomplish this end. It is a bit strange that we are not more focused on this approach, as it seems to avoid a lot of the political fallout associated with nationalization, while still avoiding saddling the taxpayer with these banks bad investments. The real problem (at least in this frame) is how to clean up the bad investments which have already been made for the taxpayer (AIG being the most blatant example) and still being made – as indicated in yesterday’s joint statement by Treasury, the FDIC, OCC, OTS, and the Fed. Simon Johnson apparently still thinks rapid reprivatization is appropriate and feasible. I wonder why so few comments address that as an answer to the problem Treasury is currently facing? Do commenters here universally feel the Administration will refuse to consider that option? We had already nationalized much of the student loan and housing markets even before there was a hint of crisis. At the very least, nationalizing further will simply make the government’s role in creating this mess in the first place (through subsidizing real estate investments at the expense of other forms of investing) more transparent, rather than pretending that the problems were created solely in the private sector. WILL YOU PLEASE CALL SENATOR CORKER FROM TENNESSEE. IF YOU SAW BERNAKE TESTIFY TODAY, IT LOOKS LIKE SENATOR CORKER IS THE ONLY PERSON ON THE PANEL ASKING ANY QUESTIONS WHICH OPEN UP AND EVALUATE EXACTLY WHAT CHAIRMAN BERNAKE IS REPORTING. PLEASE SEE IF YOU CAN HELP THIS BRIGHT MAN, WHO IS MY NEW HOPE THAT TRUTH WILL BE TOLD EVENTUALLY. Listening to Bernanke speak today was amazing. There really is going to be no accountability by the management of the banks for the role they played in the crisis. Free money to cover their bad trades with no downside risk. The powers that be seem determined to form the foundation for the next crisis. That to me is absolutely appalling. I agree with fallingdown and hope James and Simon will figure out how to save us all from the looting that is taking place all in the name of “saving us all” from the dreaded N word! What happened to the good ole days when a company failed, it went bankrupt, and people who wanted to step in to buy the pieces did so. Unlike the strange manipulations of “cash infusions” and selling Merrill(pushing off) to Bank of America for $29/share, of course, because BAC had been brought to believe that the world was on their shoulders to buy the bankrupt Merrill for $29/share! When was the last time a bankrupt company went for $29/share, and how can people wake up to the reality that our US coffers are being robbed all in the name of saving the world! If we are going privatize the banks, The management that caused this problem should be replaced and forced to pay reparations (including taking the money from their personal fortunes). To Boris: These bank shareholder have not taken any losses until they sell their shares. Many of the people are main street people that have here 401k retirement funds in banks that were thought to be conservative. I think that if the solution to this problem does protect them many of these people will depend on government handouts when it becomes time to retire. To Sophie: I didn’t hear Corker this time but I have heard him before in the Auto testimony. He like many of the Republicans is on the side of the Corrupt Big Business lobby that created this situation and funds the Republican campaigns. I think Obama is the one person that could handle bank nationalization with ease and with the public trust. I also do think that it is needed at this point in time as a lot of these banks are in some huge ruts. Here is a video I found about bank nationalization. It mentions some pro and cons of it from a few different news sources. Infolge der Finanzkrise hat sich die allgemeine Stimmung in Deutschland unter den Anlegern verschlechtert und fällt auf das Niveau des ersten Quartals 2003 zurück. Zudem rechnet nur knapp ein Drittel der Befragten (31 Prozent) mit steigenden Aktienkursen. Das sind zwölf Prozentpunkte weniger als im vierten Quartal des Jahres 2008. Mit Blick auf die Gesamtwirtschaft gehen 64 Prozent von einer Verschlechterung aus – ähnlich viele wie im Vorquartal. Ungeachtet dessen vermutet weiterhin nur ein Fünftel der Befragten (22 Prozent) negative Folgen für die eigene finanzielle Situation. Dies geht aus einer Umfrage von Union Investment zum Anlegerverhalten im ersten Quartal des Jahrs 2009 hervor. Vier Wochen vor dem Treffen der 20 wichtigsten Wirtschaftsnationen der Welt (G20) kommt Bewegung in die Riege der europäischen Steueroasen. Die Schweiz, größter Finanzplatz für internationale Privatvermögen, hat sich am Freitag offiziell zu einer weiteren Aufweichung ihres Bankgeheimnisses bereit erklärt. Ähnliche Signale werden von einem Treffen der Finanzminister der Schweiz, Österreichs und Luxemburg am Sonntag in Luxemburg erwartet. “Wir wollen die internationale Zusammenarbeit bei Steuerdelikten verbessern”, sagt der Schweizer Bundespräsident und Finanzminister Hans-Rudolf Merz nach einer Kabinettssitzung in Bern. Die Drohungen von Seiten großer Industriestaaten seien ungerechtfertigt, aber ernst zu nehmen. Für die Schweiz gelte es zu verhindern, dass sie von der G20 oder einem ähnlichen internationalen Forum auf eine Schwarze Liste gesetzt werde. “Auf Verträge einzugehen, die unter Sanktionen entstanden sind, wäre ganz schlecht”, sagte Merz. Erwartet wird, dass Österreich und Luxemburg bei dem Treffen am Sonntag ein ähnliche Position einnehmen werden. Belgien und Luxemburg, so sagte der britische Botschafter in Bern jüngst, hätten ohnehin signalisiert, dass sie das Bankgeheimnis nach 2013 “nicht in dieser Form weiterführen werden”. Ein Sprecher des Luxemburger Finanzministers wies diese Darstellung am Freitag jedoch zurück.